Equities start the day unchanged because all anyone cares about is Bitcoin. I debated turning the recap into an all Bitcoin/Litecoin/Antoncoin jam but I’m not sure I have enough experience in bubbles to accurately portray the stuff I’m seeing. Dad/Mom/Sister asking about it? Sure, absolutely. Dentist/Doctor/Veterinarian? About a month ago. Plumber/Geologist/lady who arranges fresh flowers at the market? Probably this week. The stock market has been so boring for so long that we literally had to create a new asset class to trade. You have to love human ingenuity right? The best part of this whole crypto thing is that Wall St was dead last to the game. Zero presence in trading, marketing, research heck anything! Has that ever happened before? Ever? Anyway, we’ll talk more about whatevercoins later because right now we need to talk about the next 10 days. 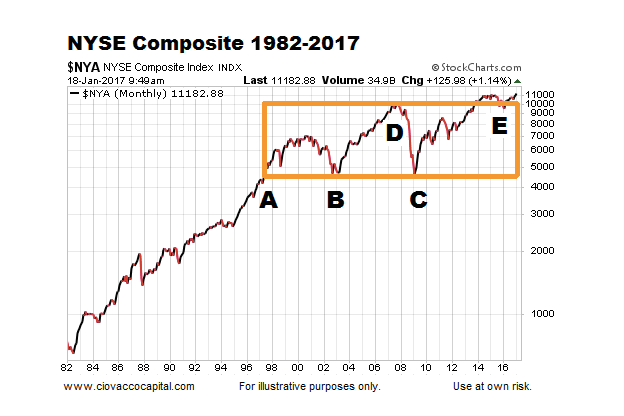 10 days to trade your way into stock market history. Up 18.4% as of this morning (27% in the NDQ) because of this (h/t JPM). Did you click that link? Please do then come back. That my friends is why the stock market is rallying. It’s not the Fed, the Fed’s balance sheet, Janet Yellen, some insidious illuminati, or anything that garbage peddlers throw at you on TWTR. 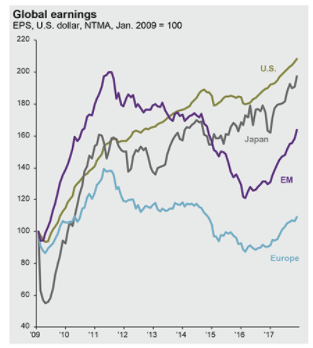 It’s global macro growth, it’s global earnings growth, and it’s a breakout after YEARS of sideways markets. I mean aren’t you glad you opened this email now? Hey, did you know today is the 30th anniversary of the movie Wall St? What a glorious piece of cinema, that guy from Platoon managed to play the role of 1) Equity Trader 2) Investment Banker 3) M&A advisor 4) Chef and 5) Real Estate Speculator all in one place! Here are the top “Trading” movies of all time: Trading Places. Wall St. Boiler Room. Wolf of Wall St. The Big Short. That’s it, nothing else qualifies. After the open we made new highs on….tada….absolutely no news whatsoever. Look, it’s Mid Dec, half of people are dialed out and the other half are trying to figure out how to open a Coinbase acct. Wall to Wall Bitcoin coverage on @CNBC got me like whatever so let’s talk stocks. Energy led the way with oil up 1%. You know it’s boring when Energy stocks are the leaders. CTL was the biggest gainer (up 8%) but it’s had a worse year than Kevin Spacey. We made new all-time highs before lunch and if you think SPX closes below 2,700 this year you crazy. Up 20% on Dec 31 just feels right to me. Losers were SCG, ULTA, ALXN, FL, and TPR. Hey…..remember when retail stocks used to dominate the losers list like Michael Jordan playing a 3rd grade pickup team? I do, those were good times. Then someone launched the EMTY ETF (a play on the decline of retail) and literally marked the bottom for the sector. Can’t make stuff like this up people, Macys is up 31% since this genius idea hit the tape and Kohl’s is up 21%. Why does irony have to be so thick in what we do? Is it this thick in other industries? By lunch we sat on 2,657 up 0.2%. The rest of the day was a bit of snore but we closed on the highs! 2,659 up 0.32%. Another victory for the Resistance against the First Order! Volumes were down about 12% vs a 30day avg and if you don’t think that’s gonna get worse as the month drags on then I have a coin to sell you. Tell you what, I have a knack for writing these things on the absolute deadest days and skipping the one’s with true fireworks. Conclusion? Write more. The Fed meets on Wednesday to raise the rate on your HELOC and that’s really the LAST catalyst we have (it’s fully priced in). After that it’s Mariah Carey, Star Wars, Egg Nogg, and overflowing recycling containers. Christmas….it’s the MOST WONDERFUL TIME…..FOR A BEER. The second is a rock and roll Millennial version of the best Christmas song ever: The Little Drummer Boy. Watch this whole thing…trust me.